What started out as sort of a dreary morning ended up turning into a pretty nice day. With all this crazy weather Seattle has been having lately, we sure didn’t want to miss out on a nice sunny afternoon. So we decided to load the entire gang into the bee mobile and we went for a walk on some trails through some nearby woods. Whenever I’m outside, I always keep an eye out for any insect flying around near by – it’s partly out of general interest in the insect kingdom (or “class” to be scientifically accurate), and partly it’s a professional hazard. When you remove stinging insects that have only one goal once you disturb them (to sting you as often as and as vigorously as possible), you develop a real keen sense for things flying at you from all different angles. So as we were taking a leisurely walk on a sunny trail earlier today, I spotted what looked like a big fat yellow jacket queen on some blackberry bushes along the trail. Given the opportunity, I like to try to snap a picture for my collection and the website, and I don’t currently have any good wasp / yellow jacket / hornet queen pictures. Without protective gear, there is a fine line between getting a good shot, and irritating the subject enough that she might sting. Especially yellow jackets don’t need much of a reason to sting a human that’s seemingly too close by. When I got close enough, I noticed that this wasn’t a yellow jacket at all! Look at the picture, the giant compound eyes were the biggest giveaway: It was a hoverfly. This fly had a black torso with yellow stripes, and was trying to mimic a wasp. Mimicry is the similarity of one species to another which protects one or both. In this case, the hoverfly tries to look like a wasp in order to trick predators into avoiding it. 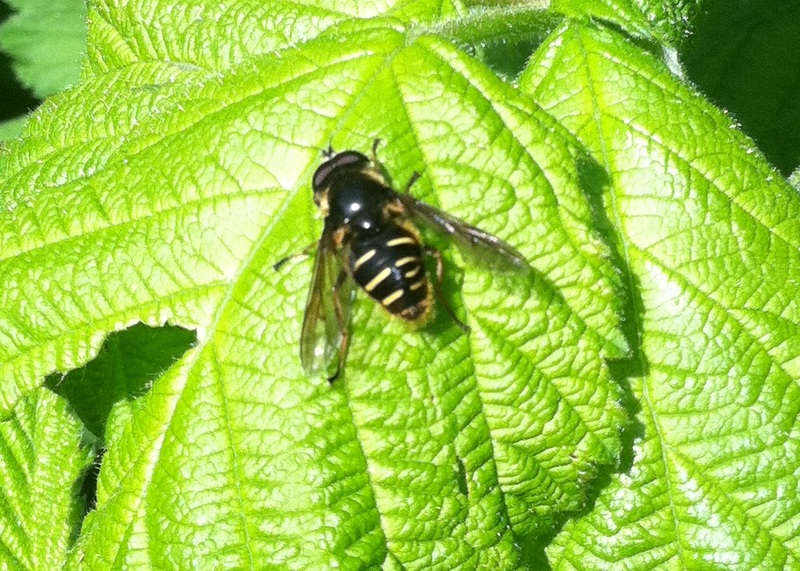 I’m not an expert in the area of hoverflies, but I am pretty sure this is a representative of Chrysotoxum Festivum. If you look closely, you can see that the yellow stripes don’t fully connect, and there are some fuzzy hairs toward the tail end. Wasps, yellow jackets and hornets generally have a completely smooth body. Of course I hope none of my readers ever get close enough to a living yellow jacket to be able to tell that they have a smooth body – because if you are that close, it usually means you’re about to get stung. This entry was posted on Sunday, May 22nd, 2011 and is filed under DanTheBeeMan. Both comments and trackbacks are currently closed.